I know, I just updated The Judy Room several months ago – however I wasn’t really happy with it. I liked many of the new elements very much, but not the way they all came together. Too dark, too busy, too clunky. A nice try, but just not really “there” yet. I’m much happier with this new, more streamlined design. It’s easy on the eye and easy to navigate, and search. Plus it lends itself to easier (and more robust) updates. Because of this new template, a few of the images and links might not render correctly. I’m on each one as they arise, page by page. Thank you to everyone for your input, constructive criticism, and guidance. The site truly a collaborative effort. 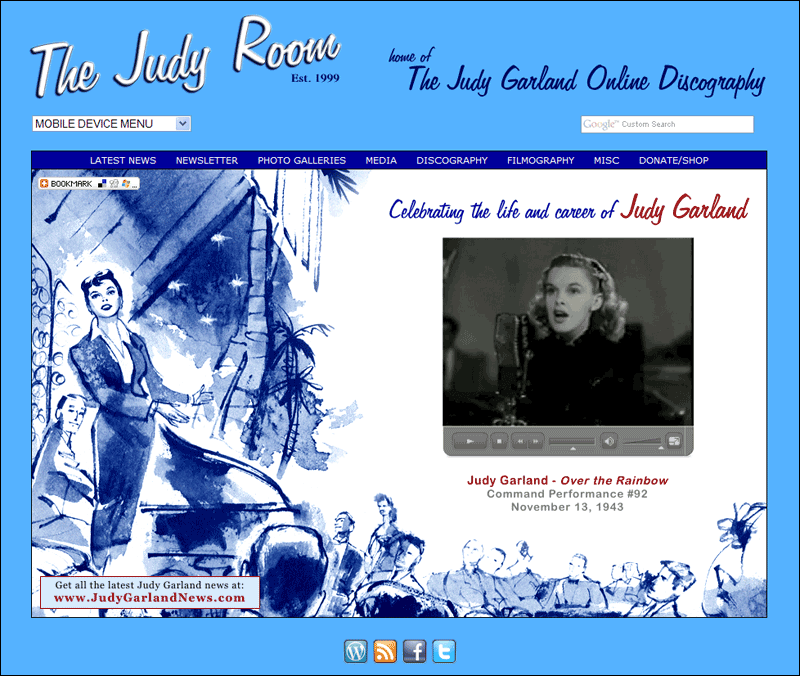 The new look and flexibility of the front page of The Judy Room is the result of the indefatigable determination of the truly creative Scott Brogan, who alone has the computer and graphic skills to have made it happen. Thanks, Scott, for all you have done in creating and innovating the site. It is the only functioning informational site on the web concerning Judy Garland, and an invaluable source of information.